Join us for our upcoming class on dairy fermentation at Raleigh City Farm! Be sure to check out the Raleigh City Farm Stand (open 9-12) before you leave! Reserve your spot HERE for a place in our Intro to Dairy Fermentation class at Raleigh City Farm! Learn some of the easiest dairy fermentation products to try yourself at home – including kefir, buttermilk, and creme fraiche! Receive kefir grains to take with you to try fermenting it yourself at home. Hear stories of Raleigh’s famous dairy history and how it affected what we drink today. Enjoy smoothies made from kefir and fresh farm fall veggies while you learn. 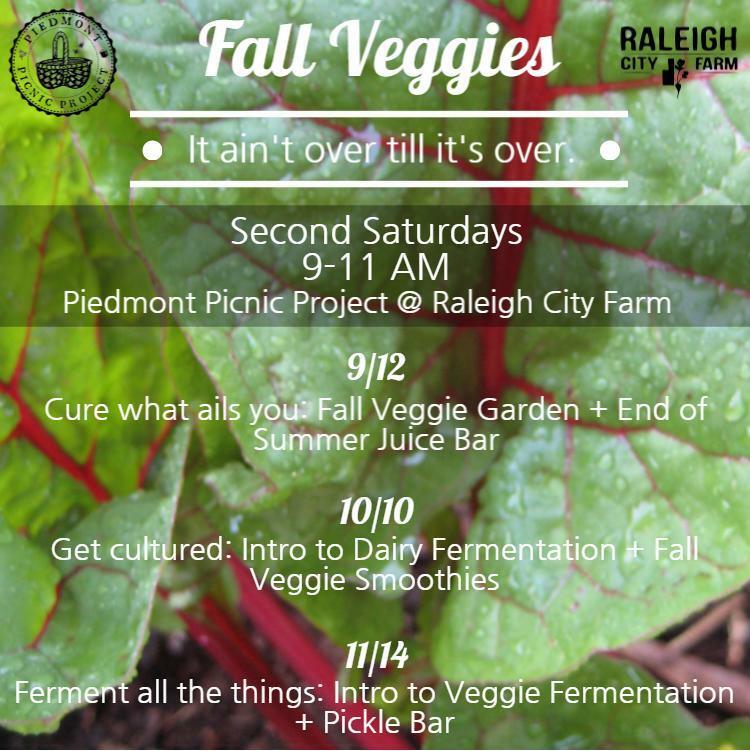 Reserve your spot HERE for a place in our Intro to Veggie Fermentation class at Raleigh City Farm! Learn how to ferment your own vegetables at home! Hear stories about southern ferments… is sauerkraut a southern tradition? Find out! We’ll use fresh farm fall veggies to make salty, sour, pro-biotic-rich fermented vegetables. Leave with a jar of your own to let ferment at home! I signed up for this online workshop too! I love learning more about fermentation. It really is an art and a science. In this amazing class, Get Cultured , you will learn how to ferment anything! Seriously, anything! Thanks for the fermentation love! Thanks for iniodructng a little rationality into this debate.